HMS students eat lunch as they watch a live-stream presentation on the book “A Long Walk to Water”. The presentation included the author and the main subject of the story. Hillsboro Middle School students are not only learning new concepts in the classroom, but they are learning that they can use these new concepts to help change the world. Tamara Cassidy is a teacher at the school. She has been teaching Reading and Math for sixth grade for three years. “I was looking through teacher social media, mostly Instagram, for a good novel to use and someone had used this book “A Long Walk to Water”. I read it in one day. I decided to use it with my class last year. The conversations that we were able to have were so powerful. To see kids in Hillsboro be motivated by something global was really touching. It was motivating,” said Cassidy. A Long Walk to Water, written by Linda Sue Park, is based on a true story. According to the Amazon description, The New York Times bestseller begins as two stories, told in alternating sections, about two 11-year-olds in Sudan, a girl in 2008 and a boy in 1985. The girl, Nya is fetching water from a pond that is a two hour walk from her home: she makes two trips to the pond every day. The boy, Salva, becomes one of the refugees of Sudan who covers the African continent on foot as they search for their families and for a safe place to stay. Salva is a survivor and his story goes on to intersect with Nya’s in an astonishing and moving way. Even though the students read the story last school year, it stuck with them. One student in particular, Zaylee Werth, could not get it out of her head. She decided that she and her peers needed to do something about it. Zaylee also knew it would take more than just her and a few friends. “We read the book last year in Mrs. Cassidy’s class. We had to research it and I learned so much about Salva. He realized that he could still help the world even though he had a real hard time. He had a website so I went on that and then I found the Iron Giraffe Project. I looked into that and realized that we could actually do it. 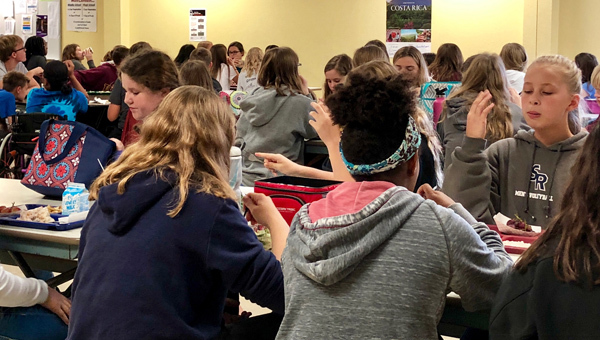 So I talked to Mrs. Cassidy and Mrs. Whisenhunt and they were really on board and started helping me figure it all out,” said Student Coordinator Zaylee Werth, seventh grade. Cassidy and Librarian Janet Whisenhunt have not only been available to be sounding boards for the girls, they helped them apply to the Iron Giraffe Project. Hillsboro students help- HMS student DJ Bartel is helped by staff member Terry Penner. DJ designed the water bottle labels for the fundraiser that the school is doing after reading the book “A Long Walk to Water”. “Now that we are officially in, we are figuring out all of the fundraisers and different things we can do. Mrs. Cassidy and Mrs. Whisenhunt are really helping us and we meet with them as a group,” said Jorgenson. The Iron Giraffe Challenge was designed by Water for South Sudan, which is an organization founded by Salva Dut, the main subject of the book. The goal of the organization is to deliver direct, transformative and sustainable quality-of-life service to the people of South Sudan by efficiently providing access to clean, safe water and improving hygiene and sanitation practices in areas of great need. The Iron Giraffe Challenge is a challenge for schools to raise $1000 or more to help ultimately raise a total of $200,000 to provide clean water wells for South Sudan. “It’s hard for one school to raise $18,000, but several schools can partner together and each raise part of that $18,000. At first Zaylee was all set to raise the $18,000, but we decided to start smaller,” said Cassidy. Last week, Whisenhunt organized a live-stream of author, Linda Sue Park and Dut for the students to watch over their lunch break. One of their most creative ideas for raising funds was to sell bottled water. 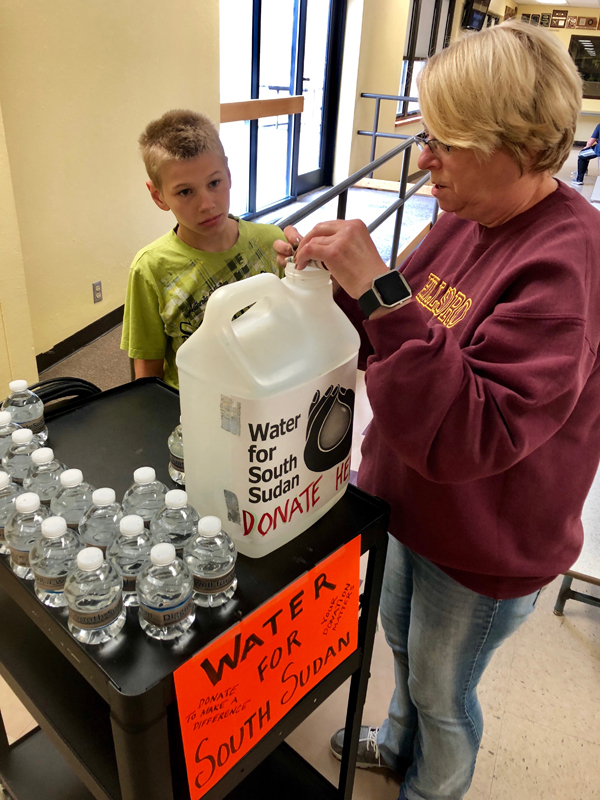 “DJ Bartel designed the water bottle labels and the class has made posters promoting the fundraiser for the middle school hallways,” said Whisenhunt. “We are going to be doing stuff with concession stands for sports that are now getting started. And we will be selling the water bottles,” said Werth. Even though they are just getting started, the students have already raised a chunk of money. “We were talking to Annaliese about her bake sale that she always does on her street during the Arts and Crafts fair and asked if we could have a box or something there for donations. She said sure and her and Trudy Hein did it and then came back to school and told us that they got like $130. We were so surprised that so many people helped. It was really cool,” said Zaylee. “We had a small well so we put blue tissue paper in it with a sign about the project. 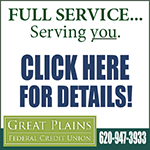 We got donations from people and then Trudy Hein put in $50 of her own money,” said Jorgenson. And there are more ideas coming. Werth continues to have bigger dreams than just $1000. “I think being able to raise money past the $1000 dollars would be cool. If you raise past that, you could win a prize of having Salva come out to your school to hear him talk. I think that would be really cool. Just being able to realize that you have made an impact around the world is pretty awesome,” said Werth. Regardless of how much they end up raising, the staff consider it all a success. “I think it is great that we can connect our curriculum to the real world. 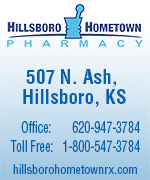 It is this type of learning that is the most meaningful,” said Hillsboro Middle School Principal Clint Corby. “It just started as something I didn’t really know how invested they would be, but it really took off,” said Cassidy. While the students working on the fundraising consists of a core group of seventh-graders right now, more may get involved as time goes on. Both staff and the students involved expressed their excitement over the possibility of what all can happen both this year and down the road. “I am planning to read the novel again after January with this year’s sixth-graders. I am hoping that it helps fuel and continue the passion,” said Cassidy. If anyone would like to contribute to the cause, they can mail in money or drop it off in the middle school office. For questions, please contact Tamara Cassidy at Hillsboro Middle School at 620-947-3184 or email her at tamara.cassidy@usd410.net.